Property 7: Skillys Big Chip Lodge. Prime waterfront. Relax, fish, quality time, enjoy! Property 11: Super Private...Amazing Views...Quiet Solitude!! Property 14: Beautiful Wood-Sided Cabin; Pontoon Boat included, privacy, and great fishing!! Property 16: *On The Lake & In The Woods! Great Winter Getaway @ $222/nite + $100 add nites! 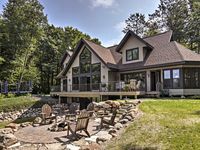 Property 23: Lakefront Hayward Home w/ Fire Pit by Ski Trails! 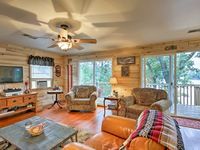 Property 24: Cozy, private, woodsy retreat; clear water, sandy bottom, close to bike trails! Property 25: Look no further - Sunset Retreat is your vacation spot! Property 28: Spacious Northwoods Home - Perfect for Families - Great Fishing!! Property 38: SPECIAL! Winter /Early Spring :Snowshoe, snowmobile, ice fish, snuggle by fire! Property 42: Quiet Cottage w/Artist Loft, Sauna, on a peaceful, great for kayaking lake! Pamper Yourself with RARE Comfort! Property 44: Pamper Yourself with RARE Comfort! Property 45: Charming Private Lake Home On the Beautiful Tiger Cat !! Book for summer fun! Property 47: Waterfront Hayward Cabin w/ Pontoon Boat Rental! Property 49: Very private lake setting with tall pines and beautiful sunsets.